The wines of Domaine Sigalas. White dry ,100% Asirtiko, Appelation of origin Santorini of high quality. THE FERMENTATION TAKES PLACE IN STAINLESS STEEL TANKS UNDER CONTROLLED TEMPERATURE 16°-18°C. White dry, 100% Asirtiko, Appelation of origin Santorini of high quality. THE FERMENTATION TAKES PLACE IN OAK BARRELS UNDER CONTROLLED TEMPERATURE 18°C, FOLLOWED BY “SUR LIES” METHOD. This wine ages in Oak barrels for 6-8 months. White dry ,70% Asirtiko 30% Athiri, Appelation of origin Santorini of high quality. Red dry , 70% Madilaria 30% Agiorgitiko Nemea. 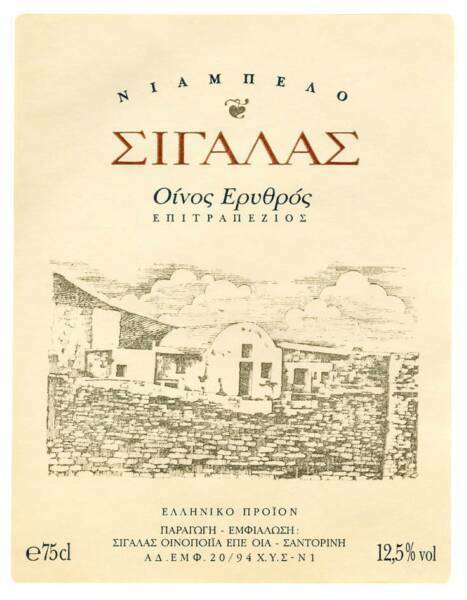 Naturally sweet wine from sun dried grapes,70% Asirtiko 30% Athiri, Appelation of origin Santorini of high quality. THE FERMENTATION STARTS IN STAINLESS STEEL TANKS UNDER CONTROLLED TEMPERATURE. This wine ages in Oak barrels for 24 months. Naturally sweet wine from sun dried grapes, 100% Mandilaria. This wine ages in Oak barrels for 18 months.